WHAT IS THE BOSNIAN SUPPORT FUND? Our small charity provides help to families diplaced by the war in Bosnia who want to return to their homes and rebuild their lives. We offer support, advice and practical financial assistance on an individual basis to more than seventy families. We have one field worker in Bosnia. He takes no salary, and we have no staff, office or overheads. WHY DID WE START THE FUND? When the war began in Bosnia in 1992, 1.5 Million people were made homeless. Many fled to refugee camps in neighbouring Slovenia with only the possessions they could carry. Their homes, farms and businesses were destroyed or occupied, and they lost everything they had worked for. The Bosnian Support Fund was established in Britain to help Bosnian refugees at Hrastnik, a refugee camp in Slovenia. We realised people were suffering because the big aid agencies were not able to offer help tailored to individual's needs, and too many refugees were being missed out altogether. Despite the best intentions of the UN, they still are being missed out, and left to cope by themselves. Our full time (but unpaid) field worker, retired Lt. Colonel Bernard McMahon, spent the following five years at the camp. With funding from the Bosnian Support Fund he helped to provide money, food, clothes, advice and encouragement for people at the camp, as well as dental and medical treatment, English classes and music and art therapy for children. When the war ended most refugees had little or nothing to return to, or they found their towns and villages had been allocated to the new Serb Republic which was created at the Dayton peace talks. Bernard McMahon remained at Hrastnik camp helping the old people in particular who had nowhere to go and no one to whom they could return. 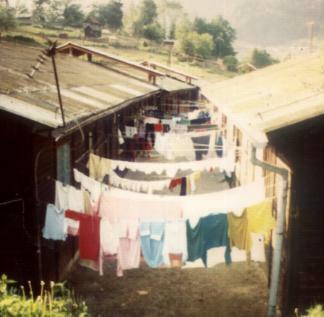 Hrastnik refugee camp, Hrastnik is a mining town near Ljubljana, Slovenia.